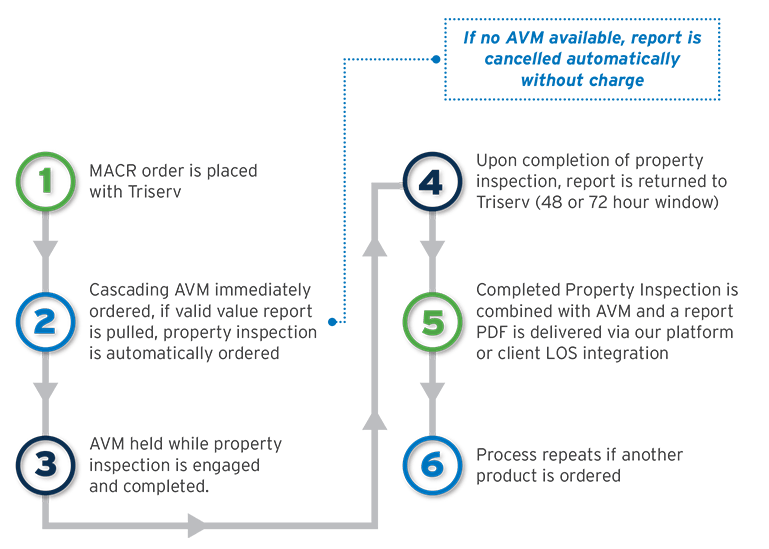 Triserv's MACR (Market Analysis Condition Report) is the perfect, low cost tool allowing you to quickly obtain an affordable and effective solution to the Interagency Guidelines requiring annual valuation/property condition reports, and the need for a streamlined home equity loan evaluation solution. Many lenders expend a great deal of effort and money ordering an appraisal product to meet this need. The high cost of appraisals along with the extended turn-around time make traditional appraisals a costly and time consuming way to perform these types of valuation activities. MACR is a product tailor-made for HELOC lenders/lien holders/servicers. It provides a comprehensive look at a property's condition, neighborhood and value with the best available data tools, combined with a physical onsite inspection performed by a professional home inspector. With a 48-72 hour national turntime and a low flat rate, MACR evaluations become a compliant, affordable, and streamlined report. Take advantage of this easy and affordable lending solution for your staff, your members and your peace of mind! Use the report with confidence knowing Triserv can provide a fast, accurate and compliant report anywhere in the United States!